Brainstorming is a group creativity technique designed to generate a large number of ideas for the solution of a problem. The method was first popularized in the late 1930s by Alex Faickney Osborn in a book called Applied Imagination, in which he proposed that groups could double their creative output with brainstorming. The technique typically involves gathering a group of up to 10 people, including some invited guests from other fields, posing a question, and asking them to respond with as many answers as possible. Their responses are recorded, and later sorted and evaluated. The theory is that members of the group will be stimulated by each others’ ideas to come up with new suggestions. Of the multiple ideas, one or more will be a good solution for the problem. Recent studies have show that because of such problems as distraction, social loafing, evaluation apprehension, and production blocking, brainstorming groups are little more effective than other types of groups, and they are actually less effective than individuals working independently. Numerous attempts have been made to improve brainstorming or use more effective variations of the basic technique. Modern methods such as the use of email to collect and distribute participants’ ideas, or computer applications that allow group members to log in and record their own contributions, may overcome these obstacles and increase the effectiveness of brainstorming. Although traditional brainstorming does not increase the productivity of groups, it provides other benefits, such as boosting morale, enhancing work enjoyment, and improving team work. There are four basic rules in brainstorming. These are intended to reduce social inhibitions among groups members, stimulate idea generation, and increase overall creativity of the group. Focus on quantity: Following the maxim, quantity breeds quality, participants are urged to generate as many ideas as they can during a brainstorming session. The assumption is that the greater the number of ideas generated, the greater the chance of producing a radical and effective solution to the problem being discussed. Withhold criticism: During brainstorming, criticism of ideas generated should be put 'on hold.' Instead, participants should focus on extending or adding to ideas, reserving criticism for a later 'critical stage' of the process. When judgment is suspended, participants will feel free to generate unusual ideas. Welcome unusual ideas: In order to follow the first rule and generate as many ideas as possible, unusual ideas are welcomed. Participants are encouraged to look from new perspectives and suspend assumptions. These new ways of thinking may provide better solutions. Combine and improve ideas: Good ideas may be combined to form a single, even better good idea, as suggested by the slogan "1+1=3." Brainstorming is believed to stimulate the building of ideas by a process of association. Before a brainstorming session, it is critical to define the problem to be discussed. The problem must be clear, not too big, and captured in a specific question such as, "What service for mobile phones is not available now, but needed?" If the problem is too big, the facilitator should break it into smaller components, each with its own question. Some problems are multi-dimensional and non-quantified, for example, "What are the aspects involved in being a successful entrepreneur?" Finding solutions for this kind of problem can be done with morphological analysis (problem-solving). The background memo is the invitation and informational letter for the participants, containing the session name, problem, time, date, and place. The problem is described in the form of a question, and some example ideas are given. The ideas are solutions to the problem, and can be used when the session slows down or goes off-track. The memo is sent to the participants well in advance, so that they can think about the problem beforehand. The facilitator composes the brainstorming panel, consisting of the participants and an idea collector. A group of 10 or fewer members is generally more productive. Many variations are possible but the following composition is suggested. Several core members of the project who have proved themselves. Several guests from outside the project, with affinity to the problem. One idea collector who records the suggested ideas. During the brainstorm session the level of creativity may decrease. At this moment, the facilitator should stimulate creativity by suggesting a lead question to answer, such as Can we combine these ideas? or How about looking from another perspective? It is best to prepare a list of such leads before the session begins. A warm-up session, to expose novice participants to the criticism-free environment. A simple problem is brainstormed, for example What should be the CEO retirement present? or What can be improved in Microsoft Windows?. The facilitator presents the problem and gives a further explanation if needed. The facilitator asks the brainstorming group for their ideas. If no ideas are forthcoming, the facilitator suggests a lead to encourage creativity. All participants present their ideas, and the idea collector records them. To ensure clarity, participants may elaborate on their ideas. When time is up, the facilitator organizes the ideas based on the topic goal and encourages discussion. The whole list is reviewed to ensure that everyone understands the ideas. Duplicate ideas and obviously infeasible solutions are removed. The facilitator thanks all participants and gives each a token of appreciation. Participants who have ideas but were unable to present them are encouraged to write down the ideas and present them later. The idea collector numbers the ideas as they are presented, so that the facilitator can use the number to encourage an idea generation goal, for example: We have 44 ideas now, let’s get it to 50!. The idea collector should read back each idea as it has been recorded, to confirm that it expresses the meaning intended by the originator. When participants are expressing several ideas at once, the one with the most associated idea should have priority. This encourages elaboration on previous ideas. Managers and other superiors may be discouraged from attending a brainstorming session, as their presence may inhibit and reduce the effect of the four basic rules, especially the generation of unusual ideas. The solution should not require resources or skills the members of the group do not have or cannot acquire. If it is necessary to acquire additional resources or skills in order to implement the solution, they should be incorporated as the first part of the solution. The solution must include a way to measure progress and success. The steps to carry out the solution must be clear to all, and amenable to being assigned to the members so that each will have an important role. There must be a common decision making process to enable a coordinated effort to proceed, and to reassign tasks as the project unfolds. There should be evaluations at milestones to decide whether the group is on track toward a final solution. There should be incentives to participation so that participants maintain their efforts. The nominal group technique is a type of brainstorming that encourages all participants to have an equal say in the process. It is also used to generate a ranked list of ideas. Participants are asked to write their ideas anonymously. The moderator then collects the ideas and each is voted on by the group. The vote can be as simple as a show of hands in favor of a given idea. This process is called distillation. After distillation, the top-ranked ideas may be sent back to the group or to subgroups for further brainstorming. For example, one group may work on the color required in a product. Another group may work on the size, and so forth. Each group will come back to the whole group for ranking the listed ideas. Sometimes ideas that were previously dropped may be brought forward again once the group has re-evaluated the ideas. It is important that the facilitator be trained in this process before attempting to facilitate this technique. The group should be primed and encouraged to embrace the process. Like all team efforts, it may take a few practice sessions to train the team in the method before tackling the important ideas. The process begins with a well-defined topic. Each participant brainstorms individually, then all the ideas are merged onto one large visual idea map. During this consolidation phase, participants may discover a common understanding of the issues as they share the meanings behind their ideas. During this sharing, new ideas may arise by the association, and they are added to the map as well. Once all the ideas are captured, the group can prioritize and take action. Electronic brainstorming is a computerized version of the manual brainstorming technique. It can be done via email and may be browser based, or use peer-to-peer software. The facilitator sends the question out to group members, and they contribute independently by sending their ideas back to the facilitator. The facilitator then compiles a list of ideas and sends it back to the group for further feedback. Electronic brainstorming eliminates many of the problems of standard brainstorming, such as production blocking and evaluation apprehension. An additional advantage of this method is that all ideas can be archived electronically in their original form, and then retrieved later for further thought and discussion. Electronic brainstorming also enables much larger groups to brainstorm on a topic than would normally be productive in a traditional brainstorming session. Other brainstorming techniques are web-based, and allow contributors to post their comments anonymously through the use of avatars. This technique also allows users to log on over an extended time period, typically one or two weeks, to allow participants some "soak time" before posting their ideas and feedback. This technique has been used particularly in the field of new product development, but can be applied in any number of areas where collecting and evaluating ideas would be useful. Extensive research conducted by Olivier Toubia of Columbia University indicates that the use of incentives is very effective within the context of brainstorming. Directed brainstorming is a variation of electronic brainstorming (described above) that can be done manually or with computers. Directed brainstorming works when the solution space (the criteria for evaluating a good idea) is known prior to the session and can be used to intentionally constrain the ideation process. “6-3-5 Brainwriting” (also known as the 6-3-5 Method, or Method 635) is a group creativity technique used in marketing, advertising, design, writing and product development originally developed by Professor Bernd Rohrbach in 1968. The aim of 6-3-5 Brainwriting is to generate 108 new ideas in half an hour. The technique involves 6 participants who sit in a group and are supervised by a moderator. Each participant thinks up 3 ideas every 5 minutes. Participants are encouraged to draw on others' ideas for inspiration, thus stimulating the creative process. After 6 rounds in 30 minutes the group has thought up a total of 108 ideas. "Individual Brainstorming" is the use of brainstorming on an individual basis. It typically includes such techniques as free writing, free speaking, word association, and the use of a "spider web," or “bubble maps” to organize ideas visually. Individual brainstorming is a useful method in creative writing and has been shown to be superior to traditional group brainstorming. Defining the problem itself and identifying the best questions to ask can be the focus of a brainstorming session. This has been called questorming. Another topic for brainstorming can be to find the best evaluation methods for a problem. Although brainstorming has become a popular group technique, researchers have not found evidence of its effectiveness for enhancing either quantity or quality of ideas generated. When placed in a group setting, colleagues or co-workers may be inhibited from speaking out by fear of criticism (evaluation apprehension), or because they believe that their ideas are not important or that others will make up for their lack of participation (social loafing). A brainstorming session is most effective if the participants are deeply motivated and believe that they have something important to contribute. “Production blocking,” the tendency for one individual to block or inhibit other people during a group discussion, is a common problem in brainstorming groups. If six people are in a group and one person is talking at length about his or her idea, then the other five people are "blocked" and less able to provide their own creative input. They may not have time to think of an idea, or they may be distracted or forget about their idea before they have an opportunity to share it. Production blocking becomes more of a problem as the size of the group increases. Studies have shown that brainstorming groups are little more effective than other types of groups, and they are actually less effective than individuals working independently. Newer versions of brainstorming, in which individuals write down their ideas and submit them for other members of the group to review, or the use of email and computer applications that allow individuals to think creatively over longer periods of time, overcome barriers like production blocking and social inhibitions. These forms may be more effective in tapping the creativity of individual members of a group and arriving at substantial solutions. How well these newer methods work, and whether or not they should be classified as brainstorming, are subjects for further research. Although traditional brainstorming does not increase the productivity of groups, it may provide other benefits, such as boosting morale, enhancing work enjoyment, and improving team work. Members of the group may become more creative when they are removed from their customary work environment. One of the most valuable benefits is exposure to the views of invited guests from outside the project, who may be able to provide new insights and perspectives from their professional or personal experience. ↑ A.F. Osborn, 1963, Applied imagination: Principles and procedures of creative problem solving (Third Revised Edition). (New York, NY: Charles Scribner’s Sons). ↑ Olivier Toubia, 2006, "Idea Generation, Creativity, and Incentives," Marketing Science. ↑ E. Santanen, R. O. Briggs, and G-J. de Vreede, 2004, “Causal Relationships in Creative Problem Solving: Comparing Facilitation Interventions for Ideation.” Journal of Management Information Systems. 20(4): 167-198. ↑ Rohrbach, Bernd: "Kreativ nach Regeln – Methode 635, eine neue Technik zum Lösen von Problemen." Creative by rules - Method 635, a new technique for solving problems first published in the German sales magazine "Absatzwirtschaft," Volume 12, (1969): 73-75 and Volume 19, October 1, 1969. ↑ A. Furnham and Yazdanpanahi, T., 1995, “Personality differences and group versus individual brainstorming.” Personality and Individual Differences, 19: 73-80. ↑ Questorming: An Outline of the Method, Jon Roland, 1985. Retrieved February 12, 2009. ↑ B. A. Nijstad, W. Stroebe, H. F. M Lodewijkx, 2003, “Production blocking and idea generation: Does blocking interfere with cognitive processes?” Journal of Experimental Social Psychology, 39: 531-548. ↑ M. Diehl and W. Stroebe, 1991, “Productivity loss in idea-generating groups: tracking down the blocking effect.” Journal of Personality and Social Psychology, 61: 392-403. ↑ B. Mullen, C. Johnson and E. Salas, 1991, “Productivity loss in brainstorming groups: a meta-analytic integration.” Basic and Applied Social Psychology. 12: 3-23. ↑ In the Encyclopedia of Creativity, Tudor Rickards, in his entry on brainstorming, summarizes its controversies and indicates the dangers of conflating productivity in group work with quantity of ideas. T. Rickards, 1999, Brainstorming, M. Runco and S. Pritzker, Eds, Encyclopedia of Creativity, (San Diego: Academic Press Vol 1), 219-228. Diehl, M. and W. Stroebe. "Productivity Loss in Idea-Generating Groups: Tracking Down the Blocking Effect." Journal of Personality and Social Psychology. 61 (1991): 392-403. Furnham, A. and T. Yazdanpanahi, "Personality differences and group versus individual brainstorming." Personality and Individual Differences. 19 (1995): 73-80. Mullen, B., C. Johnson and E. Salas. 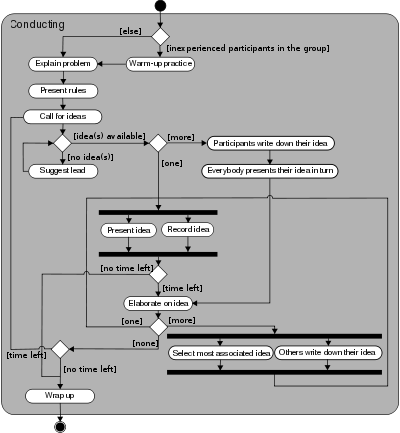 "Productivity loss in brainstorming groups: a meta-analytic integration." Basic and Applied Social Psychology. 12 (1991): 3-23. Nijstad, B. A., W. Stroebe, H. F. M. Lodewijkx. "Production Blocking and Idea Generation: Does Blocking Interfere With Cognitive Processes?" Journal of Experimental Social Psychology. 39 (2003): 531-548. Roland, Jon. "Questorming: An Outline of the Method", 1985. Retrieved February 12, 2009. Santanen, E., R. O. Briggs, and G-J de Vreede. “Causal Relationships in Creative Problem Solving: Comparing Facilitation Interventions for Ideation.” Journal of Management Information Systems. 20(4) (2004): 167-198. This page was last modified on 22 April 2014, at 20:35.